1. Milk Trains Directory by Railroad - Protoype information for the informed modeler. 2. 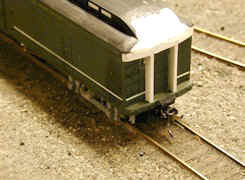 Milk Cars - Modeling the rolling stock. Includes the Green Book of HO brass milk cars. 3. Creameries & Other Facilities - All of those milk cars need a place to go! 4. Milk Train Bibliography - Where to learn more....compiled by Dwight Smith. Tom Travers kitbashes a "Shorty" National Car Container Flat in HO scale. Kitbashing Rutland 337 (or 338) in HO Scale. A construction serial by Jim Otto.